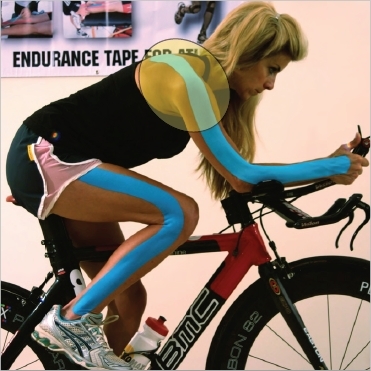 PowerTaping is the popular name given to a kinesiology taping technique that’s becoming all the rage in the sports world. And it turns out that a tape called RockTape is the perfect tape to use for it. RockTape, sporting a tighter weave, stronger adhesive and more elasticity than regular kinesiology tape, was designed for greater versatility than traditional athletic tape. Also known as PowerTape, RockTape has numerous therapeutic uses, including rehabilitation after injury, edema control, postural correction, and relief of pregnancy-related issues. In contrast to these applications, which focus on therapeutic or corrective action, the Power Taping technique focuses on enhancing athletic performance – essentially helping athletes perform closer to their innate physiological potential. Rather than taping an isolated joint or muscle group, the PowerTaping protocol involves applying tape to the entire chain of joints, muscles, fascia and nervous system components responsible for specific movement patterns. The Front Chain, for example, is responsible for the sprinting motions important to so many sports. PowerTaping of the front performance chain begins on the front of each foot, running up the front of the legs to the hips. A second strip runs along the abdominal muscles, and a final strip is applied to the muscles along the front of the neck. The tape is applied with the muscle groups in a maximally stretched position, simulating the movement associated with the sport. When applied according to PowerTaping principles, Rock Tape increases endurance, activates muscles, provides stronger, more efficient movement of related muscle groups, and significantly decreases recovery time. When these benefits are added to its biomechanically supportive, therapeutic, and healing properties, RockTape becomes a potent weapon in the arsenal of the serious athlete. No other single modality is capable of enhancing performance, preventing injury, as well as aiding and speeding recovery from those injuries that are unavoidable. Like other kinesiology tapes, RockTape uses a biomechanical lifting mechanism to lift the skin away from the soft tissue and promote blood flow. This sends more oxygenated blood to the area, maximizing the nourishment of overtaxed muscles, joints, and other body structures. Additionally, it accelerates removal of lactic acid from muscles, promoting recovery, and increases the flow of lymphatic fluid, effectively reducing swelling and edema. In addition, it interacts with sensory-neural pathways, providing additional stimuli to fatigued or weakened muscles. The therapeutic benefits of RockTape include improved flexibility and range of motion, relief of swelling, bruising, and edema, enhanced activation of weakened or injured muscle groups and correction of balance deficiencies, resulting in more rapid return to pre-injury or pre-overuse function. RockTape is available in a wide variety of colors and patterns. From the most neutral solid colors to extreme prints including skulls, camo, biohazard and cow, RockTape offers a look for every occasion. For a tape as versatile as RockTape, that’s precisely what one would expect. Power Taping is a breakthrough technique that is helping athletes achieve peak performance, peak protection of body structures, and peak recovery from injuries. The principles and techniques of PowerTaping are described in detail in the manual, PowerTaping – Taping Movements, Not Muscles. When applied according to PowerTaping principles, this top-of-the-line athletic tape can help athletes reach new levels of performance without resorting to “illegal” and unsafe performance-enhancing drugs. For more information on PowerTaping for athletic performance with RockTape, watch this video http://www.youtube.com/tapeexpert#p/c/D030DEA1BDDEB4DA/0/lso09rHJXBs.